The word Orgone means life force or life energy. It is also referred to as Ch'i, Prana, Aether, Universal Energy or Vital Energy. Orgones are a mixture of resin, metals, and crystals that are hardened into various shapes. It is said to attract etheric energy similarly to Dr. Wilhelm Reich accumulators. Some people also add small quartz crystals to the mixture for their ability to make the energy more coherent or to enhance the working of orgone. ✔ NATURAL POWER BOOSTER - Alchemies in the pyramids help clear your space internally and externally and in your immediate environment of dense vibrational energies so you can rise naturally into frequencies that carry abundance and natural power. 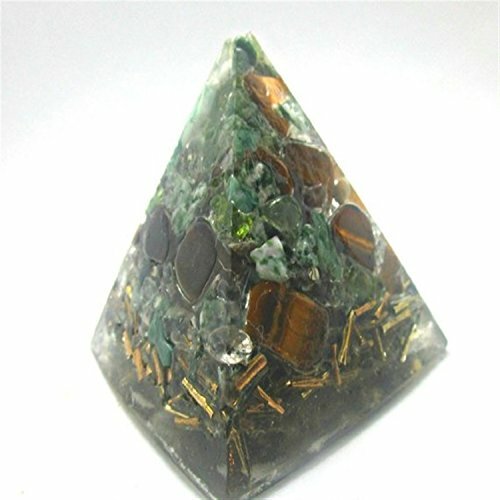 ✔POSITIVE ENERGY GENERATOR - our Orgonite Stone will absorb all negative unbalanced energy that may be in, or come into your space, and transform it into positive balanced energy, sending it back out into the environment. Also helps other living to grow healthy. ✔ BYE TO CHRONIC FRAGMENTED SLEEP - Just set up our Orgone Pyramid Surrounding your sleeping place and say bye to your Fragmented sleep that causes of your Migraines, Headache, Stress etc. Also remedies from CHRONIC nightmares. ✔ DEEPER MEDITATION - This Positive Energy promoter Stone make your place more spiritually rich that promote Deeper meditation. If you have any questions about this product by Orgone Vibes, contact us by completing and submitting the form below. If you are looking for a specif part number, please include it with your message. Love is a Four-Legged Word, a prayer flag honoring our faithful and loving dogs and cats. Turtle, Owl, Bear, Spirit Animals' Prayer Flag All proceeds to families in Mexico.